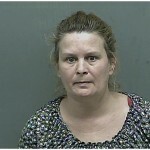 KINGSPORT, Tenn. – A Tennessee woman was arrested after passing a counterfeit $5 bill at a local store. She told police she read online that President Barack Obama signed a new law making it legal for people on a fixed income, reports the Times News. The clerk suspected it was counterfeit since the front and back sides, which were printed on standard printer paper, were coming unglued. Officers found a black and white $100 bill in her purse with the back of the bill upside down.